When you want to learn more about the history of the ancient Greek Macedonian Kingdom and like to see one of the best archaeological sites in Greece, you should head for the Museum of the Royal Tombs in Vergina and the nearby ruins of the ancient city of Aigai. 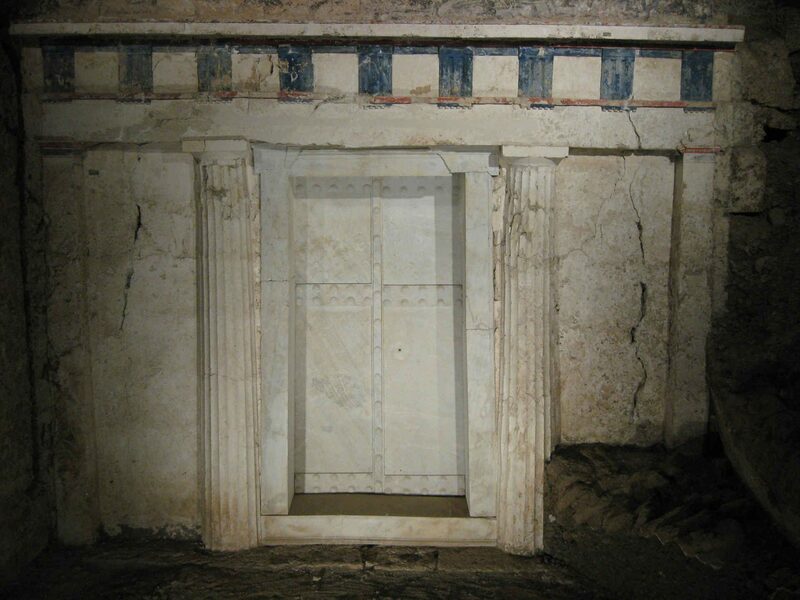 Here you can visit the stunning Macedonian Vergina Tombs, where the remains of King Philip of Macedonia, the father of Alexander the Great, were found. 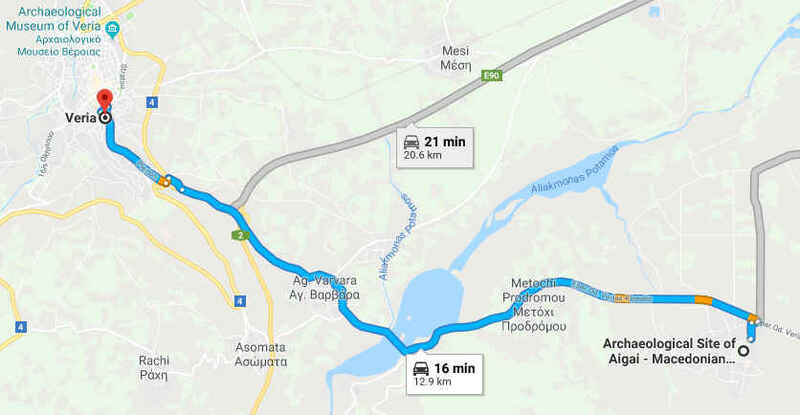 ⇒ Planning to go by bus, train or car from Thessaloniki to Vergina? 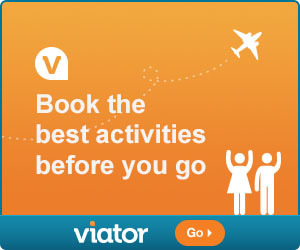 Check out this useful travel information! 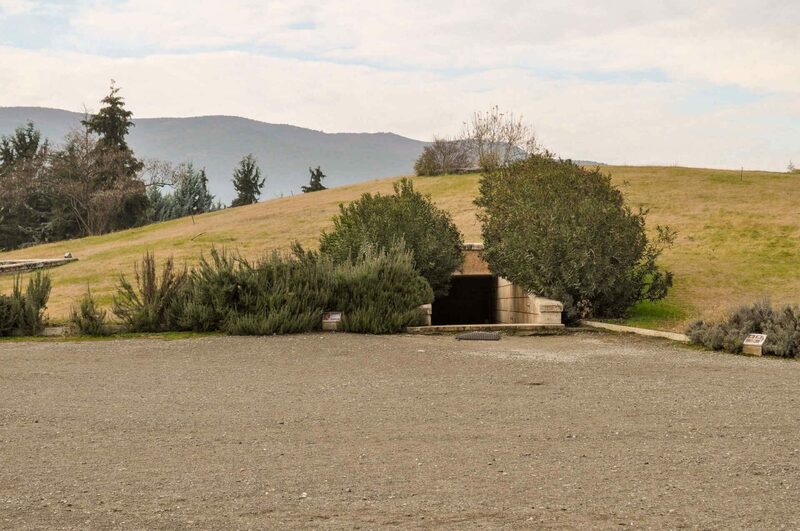 Entrance to the tombs of members of the Macedonian Royal Family at the Vergina Museum in Northern Greece. Vergina is the name of the modern village that now exists at the same place where once the ancient Greek Macedonian city of Aigai was located. The Thessaloniki day trips on offer to Vergina or Aigai are the same thing. So don’t get confused with the naming. 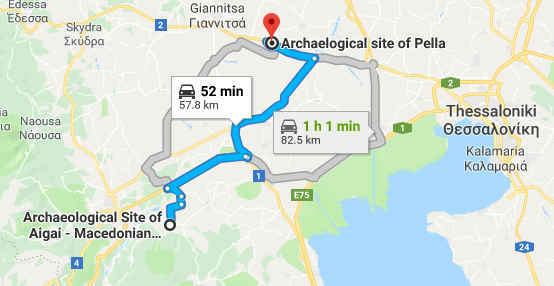 Vergina & Aigai is the same place. The tomb of King Philip of Macedonia after it was excavated in Vergina in 1977. Besides the tomb of King Philip II, you can see three more tombs in the museum. The Royal Tomb Museum of Vergina is built within a (reconstruction of the) tumulus (mount) where the tombs originally were found in. Beautiful treasures found in the tombs are on display. It is one of the most important historical places to visit in Macedonia. 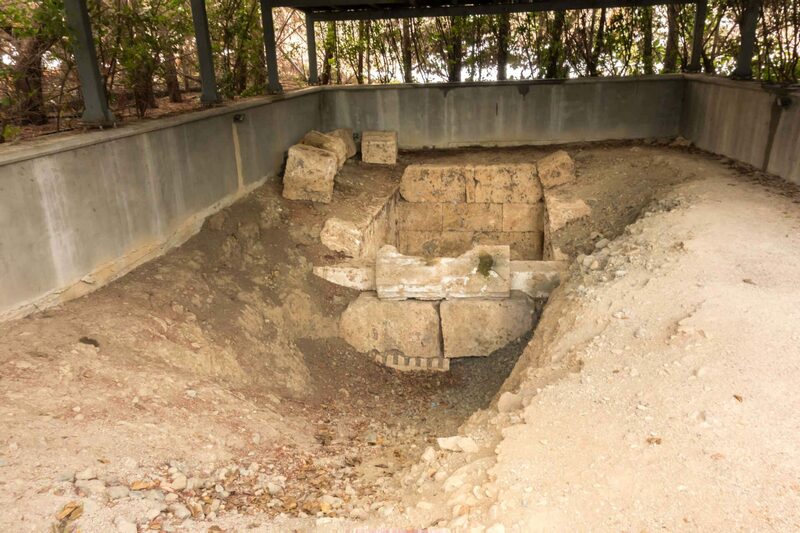 The museum of Vergina and the Royal Tombs are within this Tumulus! The Macedonian Greeks, just like other ancient Greek tribes, buried their dead in a small artificial hill called tumulus (plural: tumuli). These mounts of accumulated earth covered the actual tomb. The actual tomb also had a sign bearing the name and the fathers’ name of the dead. A more important person in the dynasty would have a bigger tumulus and even a temple. This practice is already mentioned in the writings of Homer. 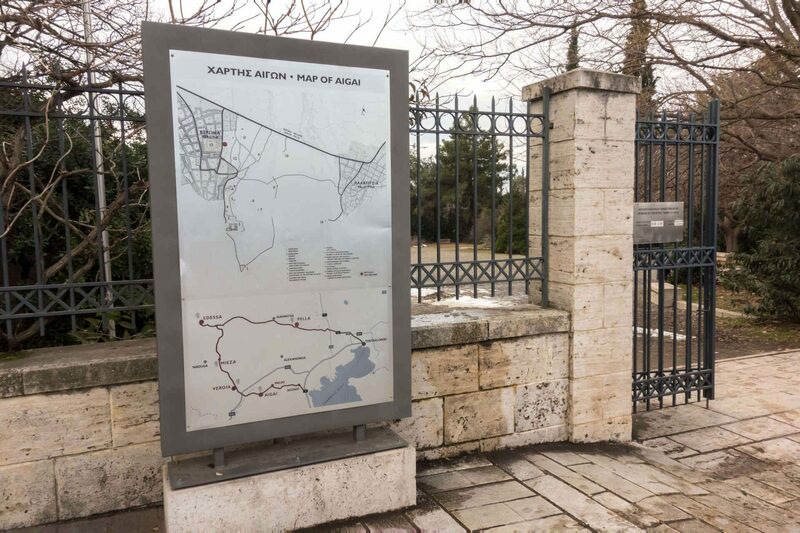 Map of the ancient city of Aigai at the entrance of the museum at Vergina. Aigai is a really important place in history, as it was the first capital of the Macedon Kingdom that initially only governed the northeastern part of Greece. It became one of the biggest and most influential kingdoms in the world. King Philip II succeeded to overthrow the old powers like Athens and Thebes and his son Alexander the Great conquered half the world. The Macedonian Kingdom existed from 808 until 168 BC. For most of those years, Aigai was the capital of ancient Macedonia (until 399 BC). When the Kingdom really started to flourish the capital was moved to Pella, about 58 km away. Pella was the capital until 168 BC when the Macedonian monarchy was abolished by the Romans. Ancient Pella was the second capital of the Kingdom of Macedonia. Vergina is located at the foot of the beautiful Pieria Mountains in Macedonia, Greece. Vergina or ancient Aigai, is located at the foot of the Pierian Mountains, southwest of Thessaloniki and only about 14 km away from the beautiful town of Veroia. The distance Thessaloniki Vergina is approximately 70 km. From the higher part of the archaeological site of Aigai you have a view over the enormous plain from where the rulers of the Macedonian Kingdom looked out over their kingdom. The plain is at three sides surrounded by mountains and the other side reaches until the sea which is at a distance of about 25 km. At only 5 km to the west is the Aliakmonas River that flows into the sea and might have been used for transport in ancient Greece. Tomb 2 of King Philip of Macedon, a very impressive tomb with two chambers. Tomb 3. The Prince’s Tomb (Tomb of the son of Great Alexander), in which they found a wall painting in the anti-chamber that depicts a chariot race. The 13 to 15-year-old boy had been assassinated together with his mother Roxanne. Tomb 4. A tomb that was looted and its materials used for other buildings. Nicely reconstructed though with columns and façade. Tomb 1 with fresco that depicts the mythological story of the “abduction of Persephone by Hades”. When you look at the tomb from above you can see a part of the fresco through the opening in the tomb. A copy of the fresco is exhibited in the museum. The Heroon, a small temple. Gold and purple cloth in which the bones of the dead were wrapped. The golden myrtle wreath of one of the wives of King Philip II of Macedon. Golden larnax with the bones of a wife of King Philip II, probably princess Meda. A gilded silver sheet that covered the front and underside of a leather gorytos with scenes from the conquest of a city. Golden larnax that contained the bones of King Philip II, made of 24 -carat gold, 11 kilograms and embossed with the Vergina Sun symbol. Gold wreath of oak leaves worn by King Philip II on the pyre. Bronze gilded funeral wreath with clay fruits. Iron spears and javelins, shields. Pair of gilded bronze greaves. Funerary steles with inscriptions of names of the deceased in Greek. Gold larnax with Vergina Sun of King Philip II in Vergina Museum. Many day tours from Thessaloniki will visit Vergina and Pella on the same day because they are historically very related and close (about 55 km) to each other. 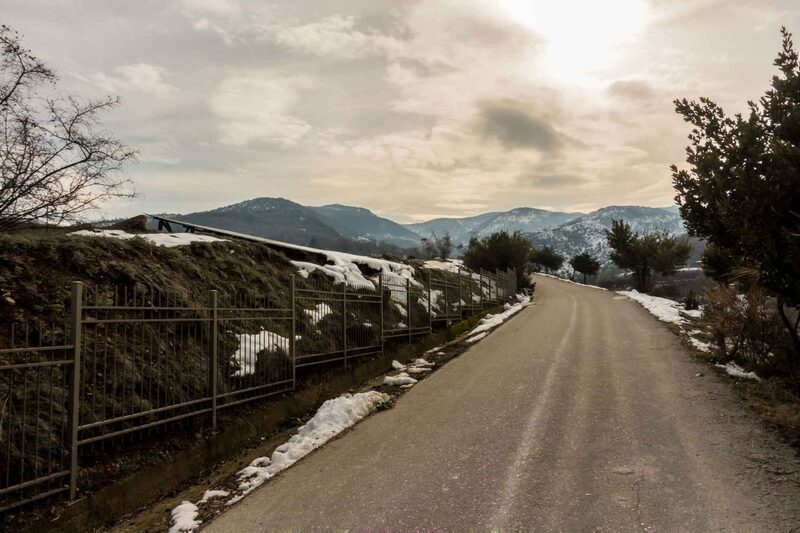 ⟹ During the Pella and Vergina Day Trip from Thessaloniki you will visit the archaeological sites of Pella and of Aigai, the Royal Tombs Museum of Vergina, and the Museum of Pella, during an almost nine hours lasting trip with an English speaking guide. 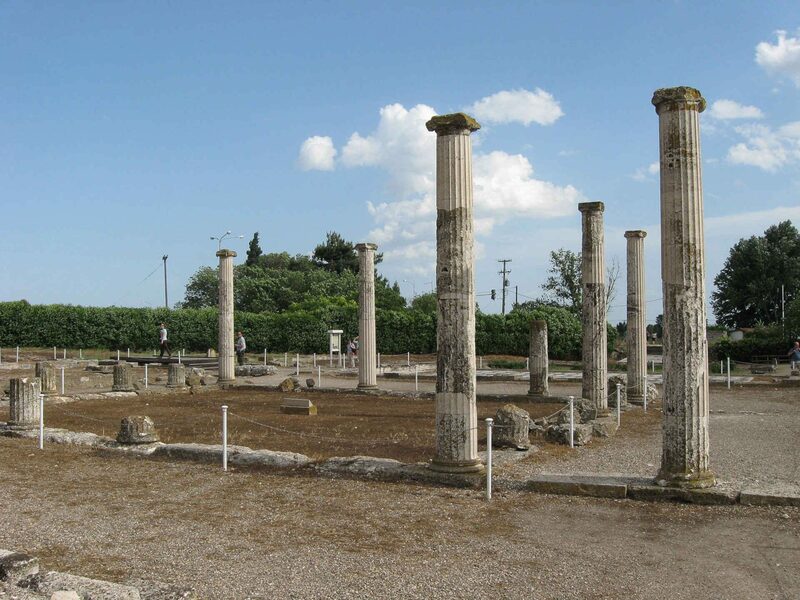 ⟹ The Pella and Vergina Full Day Tour is another excursion from Thessaloniki. You will visit the historical site and museum of Pella, as well as the royal tombs at Vergina. No visit of the nearby archaeological site of Aigai though. This excursion to Vergina lasts all day. 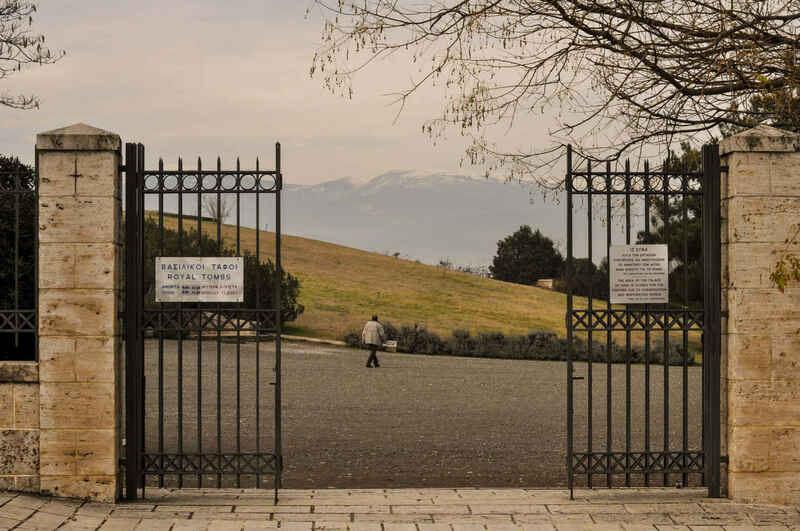 Entrance gate to the Vergina tombs and museum. In the back you can see the snow-peaked Pieria Mountains. In the museum, you will see the gold and purple cloth that was found in the anti-chamber of the tomb of King Philip of Macedon. In this cloth were wrapped the bones of one of Philip’s wives, probably Meda, who by tradition had sacrificed herself at the funeral. The cloth with the bones was found in another golden larnax, together with a golden diadem decorated with flowers and enamel. After they had burned the body of the deceased, they would collect all the bones with great care and wash them in wine. Next, the gold with purple cloth was spread over the bottom of the chest and the bones were laid out in order. Then they were covered with the purple cloth and a golden wreath was placed above this. When ready they sealed the larnax inside the marble sarcophagus. 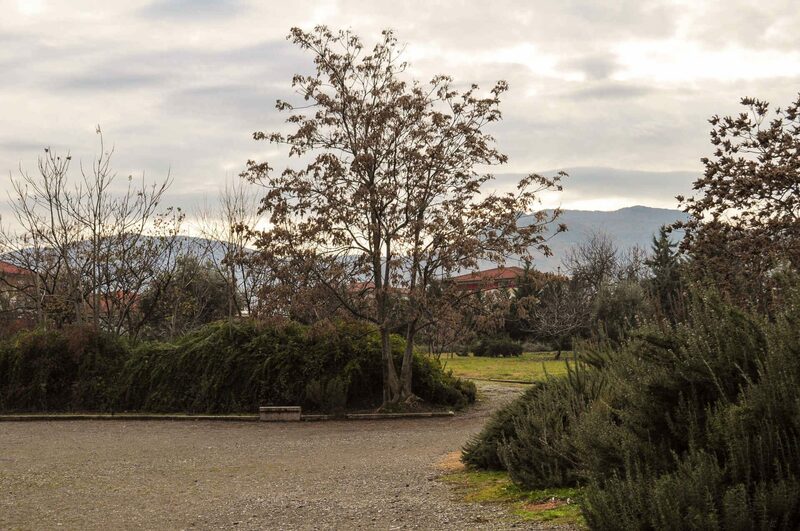 Beautiful park around the Museum of Vergina. 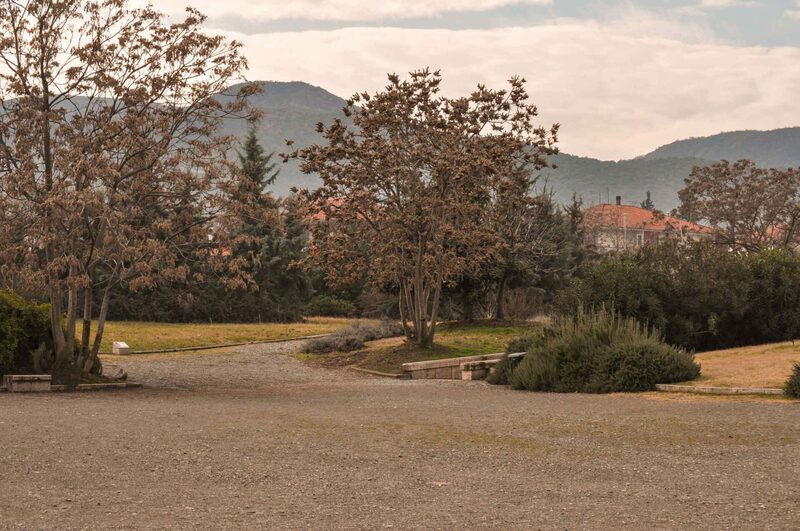 The park around the Greek Museum of the Royal Tombs in Vergina, in the North of Greece. 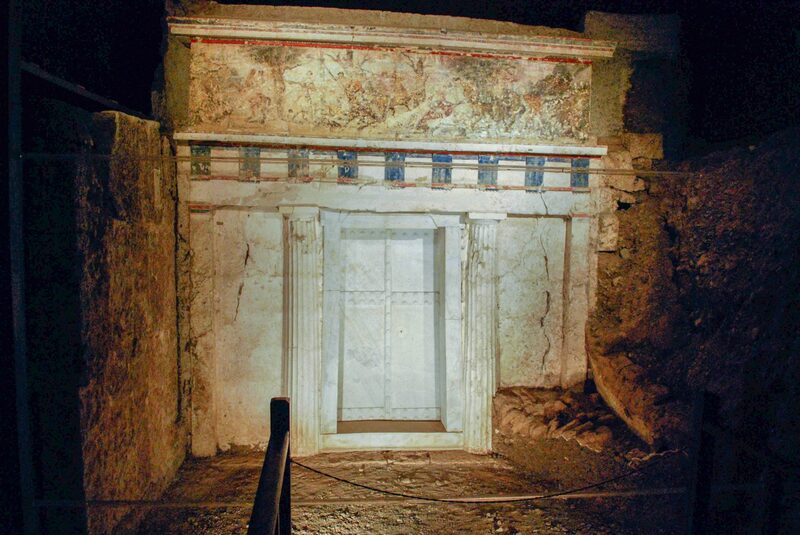 The Vergina Tombs are impressive ancient Greek landmarks you should visit. The museum with the Royal tombs is built over the tombs. To be more precise, the great tumulus (the mount) the tombs were found in, has been reconstructed and the museum was built underground around the tombs, within the tumulus. It is a really spectacular museum with all the excavated golden and silver treasures exhibited around the tombs, like the golden larnax in which the bones of King Philip were found, and the golden myrtle wreath. In the museum, they have achieved a mystic atmosphere around the temples, tombs, and artifacts by the dimmed lighting. You are actually walking in the dark which makes that the treasures stand out even more, especially the gold ones that are lighted. You can not enter the temples, but you can get close to them by descending the stairs. 3D reconstruction of the Tomb of King Philip II of Macedon in Vergina (video). Small models of the temples have been created to show the public how they looked inside, and where the objects must have been positioned before they closed the heavy marble doors of the temples and sealed them. When they excavated the tombs in 1977-78 the objects were not neatly positioned as you can imagine. Thousands of years and several earthquakes had thrown the contents of the tombs upside down. They were very carefully cleaned and restored by utterly patient archaeologists and other experts. Fresco found on the wall in the small tomb. You can see part of the fresco when looking from above into the tomb. A copy of the wall painting is exhibited in the museum. It is really impressive to see how some objects, like an enormous shield or paintings on pottery, have been restored. It is obvious, that sometimes archaeologists only found the remains of an object in the soil. They spent thousands of hours to search for all the tiny pieces, and laying them out until it made sense. In the museum, they play a film of around 15 minutes length which takes you through history. This makes it more easy to understand everything you will see in the museum. Don’t skip this film! You can find videos on YouTube that will show you the interior of the museum. In 1977 the archaeologist in charge of the excavations in Aigai, Manolis Andronikos, discovered the royal tombs in the Great Tumulus (the biggest burial mount in the area with a height of 12 meters and a diameter of 110 meters). He uncovered the temple-shaped tombs, but even more. 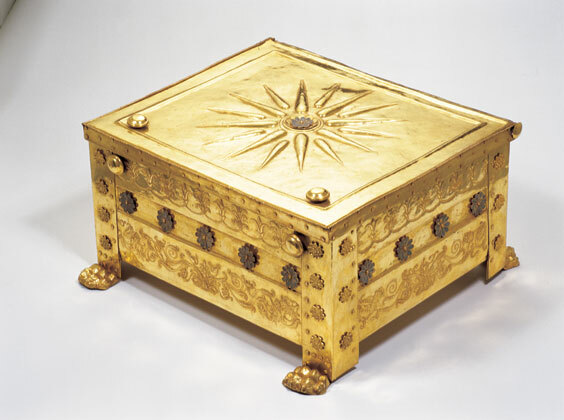 He found a golden box (the larnax) within a marble sarcophagus with the symbol of the Greek Macedonians, the Vergina Sun, depicted on top. This box contained the bones of a deceased person and research showed it to be the remains of the famous King Philip II, the father of Alexander the Great. King Philip had been assassinated in the theater of Aigai. Gold larnax and golden wreath found in the tomb of King Philip II. 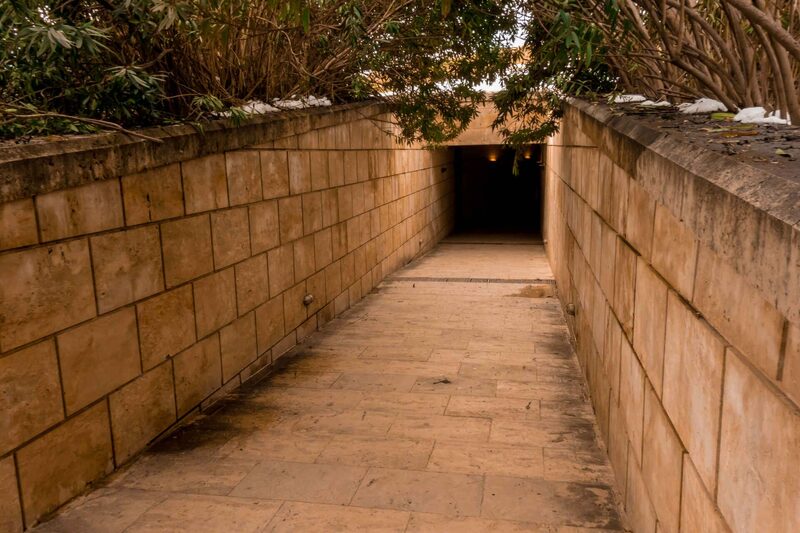 While many other tombs had been plundered, King Philip’s tomb was found untouched with all the treasures still there. The façade of his tomb is impressive with a frieze painted in bright colors. Alexander’s tomb hasn’t been found yet, but it is sure he was not buried in Aigai. ⇒ If you are interested in ancient Greek Royal Tombs you should also visit the tomb of Atreus in Mycenae in the Peleponnese! This tomb is one of the most famous landmarks of Greece. Of course, Mycenae is at the other side of Greece, but just keep it in mind. From April 1. to October 31. a ticket costs 12 euro. For opening hours visit the website of the museum. Here you will find up-to-date information about opening hours, holidays, a list of free admission days and price information. 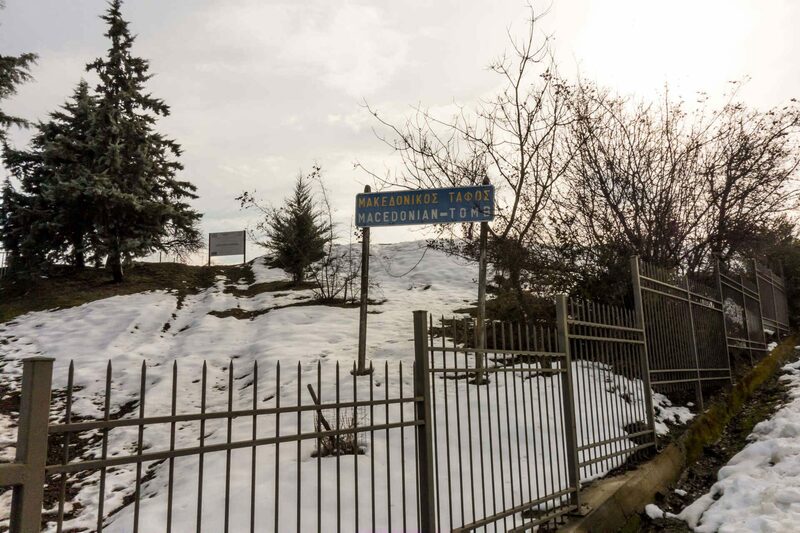 During winter, the Vergina Museum is open daily from 09.00 to 17.00 and closed on Monday. From November 1. to March 31. a reduced price of 6 euro is valid for all visitors (single tickets only). The Palace of Aigai is open to the public Monday to Friday from 10.00 to 14.00 and closed on Saturdays, Sundays and official national & public holidays. You can contact the museum for more details by phone at +30 23310 92 347. Taking photos (even with flash turned off) is strictly forbidden in the museum. Video of a travel blogging couple attempting to visit every UNESCO World Heritage Site in the world. Here they are at Vergina. Map of the archaeological site of Aigai that shows, amongst others, the location of the Palace, theatre and the acropolis. What to see at the archaeological site of Aigai ? The palace of Aigai was constructed while King Philip II was in power of the Macedonian Kingdom, from 359 to 336 BC. It was built on top of a hill overlooking all the plain below. It is the biggest building of classical Greece with a size of three times that of the Parthenon. At this moment, the reconstruction and rebuilding of the palace are taking place. The façade of the palace has been rebuilt and is open to the public. It is expected the project will be finished around 2022. Three Macedonian tombs that belonged to kings of the Teminid Dynasty. The city walls were three meters thick and reinforced with towers, and surrounded the slope where the city center was as well as the acropolis. Stones brought to Aigai from the nearby Mount Vermion quarries were used for the building of the walls, as well as unbaked mud bricks. There was a big gate and a smaller one. The theater was built close to the palace in the 4th century BC. Only the first row of seats and the stage were made of stone. This is the theater where King Philip II was murdered. This sanctuary complex was built in the 4th century BC along the road that leads to the theater and the palace, and comprises the foundations of two temples and an altar. Excavations uncovered royal offerings to the goddess. This ancient cemetery was built outside the ancient city of Aigai. 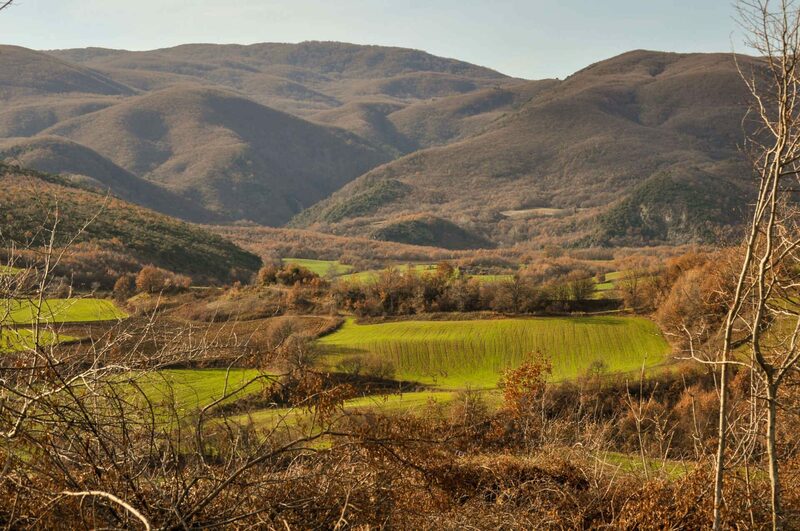 Along the road from Vergina to Palatitsia, you will see hundreds of small hills. These small hills cover the actual tombs. There are more than 500 of these mounts (tumuli), and the earliest dates from the 11th century BC. A group of tombs belonging to important female members of the Temenid dynasty. The “tomb of the golden lady of Aigai” is the tomb that was found intact and which contained the richest female burial known until today in the Macedonian era. The tomb of the mother of Philip II, Eurydice, also was found at this site. Amongst others they found a throne with impressive paintings inside the tomb. 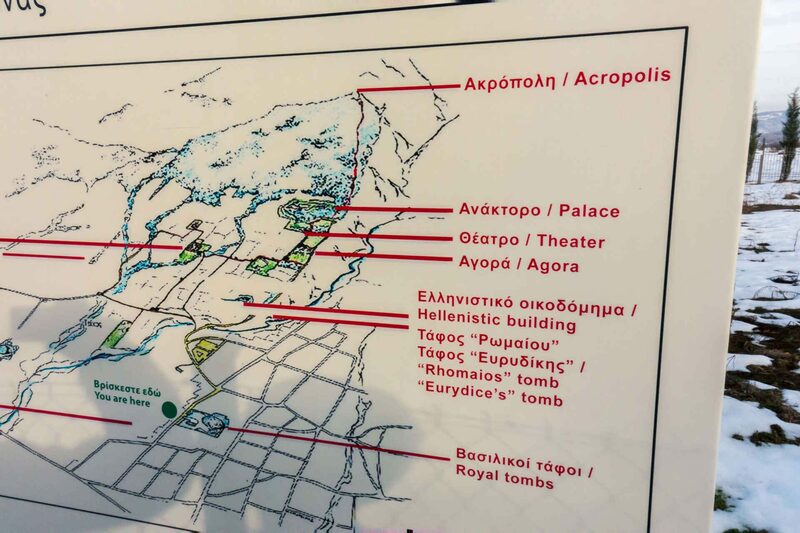 The daughter of Philip II, Queen Thessaloniki, also has her tomb at this cluster. It has a marble throne inside and was built in the 3rd century BC. Close to the village of Palatitsia and at the eastern edge of the “Cemetery of the Tumuli” two adjacent clusters of tombs were found covered by two tumuli. Inside the tumuli, archaeologists found five monumental Macedonian tombs and three cist tombs which probably belonged to a prominent family of Aigai. Macedonian tombs along the winding road uphill that takes you to the theatre, the palace, and the acropolis of Aigai. There are countless monuments at this huge archaeological site, listed on the Unesco World Heritage List. All the land of Aigai is said to have comprised over 800,000 hectares, of which only the city center was surrounded by walls. Excavations continue, and it is only a matter of time before new treasures will be uncovered. Excavations in progress just outside the museum. 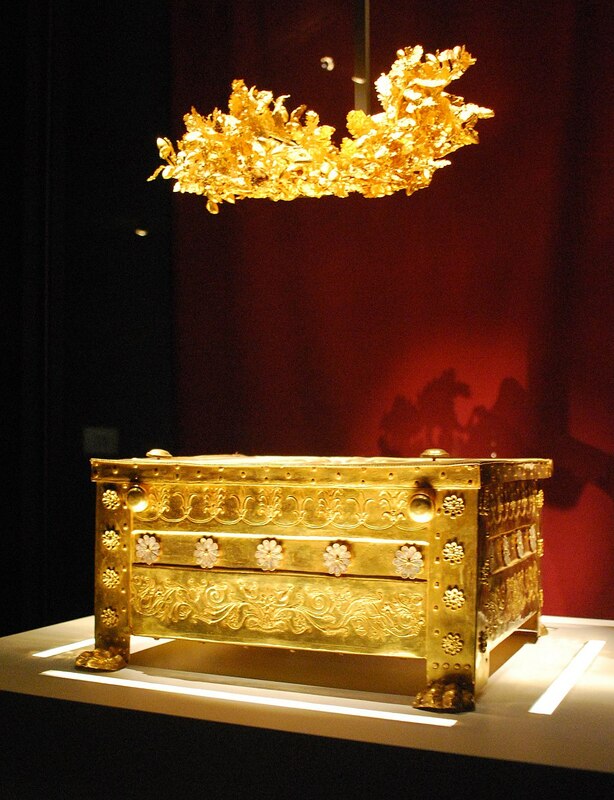 If you want to see the Royal Tombs in the museum of Vergina, as well as the archaeological site of Aigai, be sure you will pick one of those day tours from Thessaloniki that will show you both and not only the museum! Beware that you will have to walk at least one km hill upwards if you want to visit the ancient theater, the palace and the Acropolis of the Aigai archaeological site! The road uphill, to the palace and the acropolis of ancient Aigai, that leads along more burial mounts with Macedonian tombs which are still being excavated. Domaine Kalaitzis This wine estate is close to Vergina and Veria, and situated on a hillside overlooking the surrounding vineyards. It’s a luxury accommodation with eleven rooms and a restaurant for fine dining. ⇒ The archaeological site of Dion is another jewel you should visit. Ancient Dion was the sacred city of the Kingdom of Macedonia. Countless statues of gods and goddesses, ruins of Greek bath houses, theaters and city walls are scattered over a huge park with lofty vegetation and many ponds. Veroia or Veria is the nearest big town to Vergina at a distance of about 13 km. It is a very charming town with an old city center where you can see the most beautiful traditional buildings. If you have the opportunity it is absolutely worth to spend some time to discover this amazing town. There is evidence that the town was already inhabited in 1000 BC. 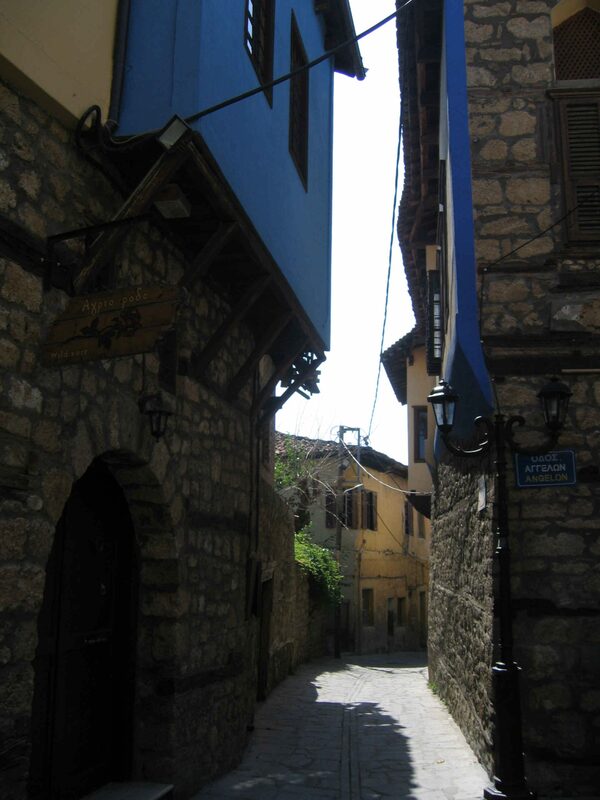 During the reign of the Macedonian dynasty, Veria was a very important city. In the Byzantine Empire it was the third important city after Constantinople (Istanbul) and Thessaloniki. A charming old quarter of Veroia. There is an incredible number of Byzantine and post-Byzantine churches preserved in the town, which has given Veroia the nickname “Little Jerusalem”. Besides the churches, many traditional quarters and museums can be visited. one of the few cities in Greece providing a free wireless network downtown. Olganos VL Boutique Hotel A small luxury hotel, located in the beautiful old Jewish quarter of Veroia. 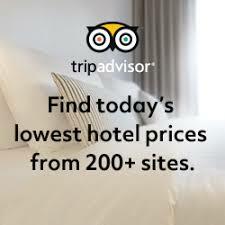 The hotel has three rooms and four suites, and is close to the important monuments, restaurants and bars.